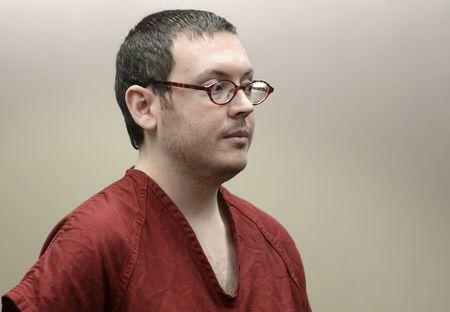 DENVER (Reuters) - A University of Colorado psychiatrist who treated convicted theater gunman James Holmes decided against placing him on a mental health hold after he expressed homicidal thoughts because it might "inflame him," police documents showed on Wednesday. The disclosure came in notes a university police officer wrote in her discussions with psychiatrist Lynne Fenton little more than a month before the July 2012 massacre, and released by the school at the request of several media outlets. Fenton had seen Holmes, who was in the school's neuroscience graduate program, several times in the months before the massacre. It was already known that Holmes told her of his desire to kill, but the newly released documents provided more insight into her dealings with authorities. Holmes, 27, was convicted last month of murdering 12 people and wounding dozens in the shooting rampage at a Denver-area cinema during a midnight screening of Batman film "The Dark Knight Rises." He was sentenced last week to 12 consecutive life sentences with no parole for the murders, and an additional 3,318 years for attempted murder and explosives charges. In handwritten notes, university police officer Lynn Whitten wrote that Fenton said she had decided against an involuntary commitment because she thought Holmes was "borderline." "Don't think it would help; would just inflame him," Whitten paraphrased Fenton as saying. Fenton testified at the murder trial that Holmes told her he wanted to kill as many people as possible, but that she did not believe she had the legal authority to place him on a mental-health hold because he did not specify a target or plan. The widow of one of the victims killed in the massacre has sued the university and Fenton, claiming they could have done more to prevent the shooting. The university said in a statement accompanying the document release that the school "participated fully" with authorities in the criminal proceedings. "The university has nothing to add to the testimony given by those individuals on the stand, except to say that we believe our faculty and staff acted responsibly," the statement said. The lawsuit filed against the school and Fenton, as well as lawsuits pending against the theater where the massacre occurred, were placed on hold until the conclusion of the criminal case.